I used a heavy weight fabric for this project. I didn't provide measurements for this project, instead I have shared an image below. The measurements on the rectangle piece of the cloth you use will depend on the size of the cushion or pillow. 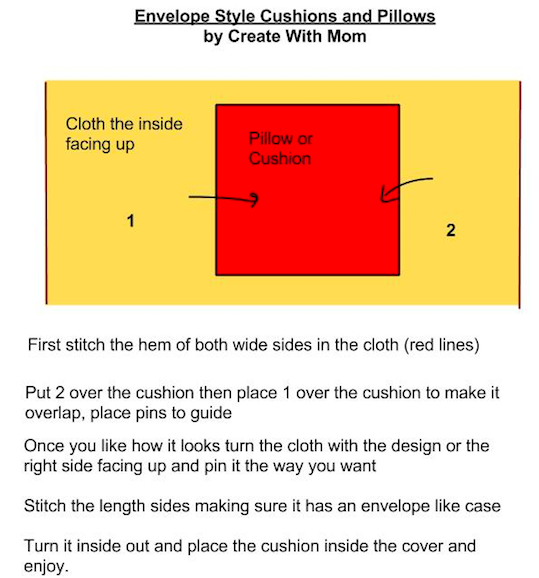 Once you make a cushion or pillow it will get easier to stitch up lots in many creative ways such as joining different pieces of fabric. I like the look of these pillows. Though I'm not very crafty it doesn't sound that hard - since I'm stuck in with the storm and I have some fabric I might give this a try! Thanks! I will have to give this a try! I am not very useful when it comes to sewing, I can sew buttons and the occasional ripped seam so I might be able to do this! My mom has a sewing machine that has been sitting there for years now, I should dust it off! I love the new fabric. I have a dog pillow that I've been wanting to cover with an envelope type cover. This makes it look a lot easier than what I had imagined! This is an interesting DIY project! Thanks for sharing! Oh I like! What a great idea to change up throw pillows to match different decor! Your pillows look store-bought! I love this idea! Oh wow! These are very cute :) Very handy as I was actually thinking I would love to recover some throw pillows I have!